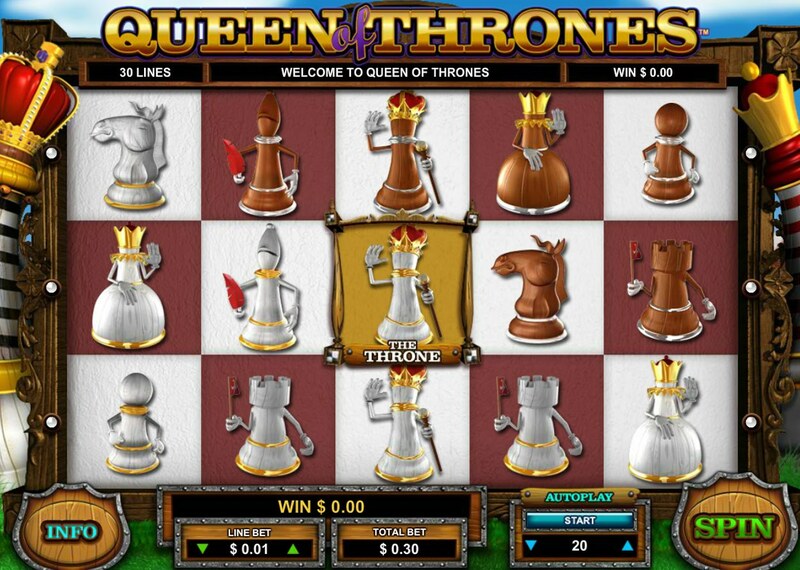 I’d like to start this review with a very corny joke featuring the punchline, “chess nuts boasting in an open foyer”, but instead I’ll skip merrily along and tell you about exciting developer Leander Games’ great chess-themed slot, Queen of Thrones. If you’ve played any of Leander’s online slots, like the Arabian-themed Ali Baba slot, or their cracking poker-inspired game, Castaway, you’ll know the developer likes to do things a little differently. Queen of Thrones is no different. 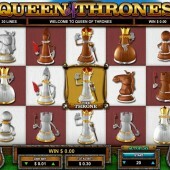 A 5 reel, 30 pay-line slot with betting starting at just $0.01 a coin, chess is the big theme here, with the reels filled with familiar chess pieces like the pawn, bishop, knight, and king and queen. Watch the Queen Capture Enemy Pieces and Turn Them Wild! The Wild symbol substitutes for all regular symbols other than the Scatter and Bonus. But it’s here you’ll notice that the center slot on reel 3 has a frame around it. There’s a good reason for that - it marks the Throne, and if the Queen lands in it the bonus feature will be triggered. Here, the Queen ‘captures’ any enemy’s pieces (black or white, respectively) and turns them into Wilds. 3, 4 or 5 free spins symbols on the reels will award 10-30 free spins respectively. At the start of the free spins round, you will be assigned a color – white or black. When a chess piece of your color appears in the middle spot on reel 3 during free spins, it captures any enemy’s pieces that appeared in positions your piece can reach (e.g. pieces placed diagonally from your bishop) and turns them Wild. If a King appears on the center spot it grants you three extra free spins. The “Big Capture” Bonus can be triggered when three Knight Bonus symbols land on reels 1, 3 and 5. Simply pick 5 squares from the 25 on-screen to reveal hidden prizes. It’s good to see a slots developer trying something a little different with their reel symbols, and Leander have at least tried to inject a bit of chess magic into this game. Queen of Thrones is yet another sign that good things lie ahead for Leander.